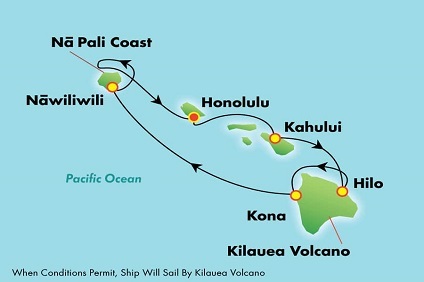 An island cruise lets you experience the true spirit of an Hawaiian vacation where the ancient culture and enchanting beauty of the islands combine with the allure of the sea to create an unforgettable Hawaiian experience. Venture into a hidden paradise of lush emerald valleys, spectacular waterfalls, smoldering volcanoes and secluded beaches. 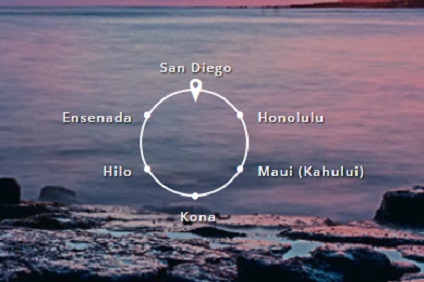 Visit all the major Hawaiian Islands. Oahu has a reputation for having the most consistently beautiful weather – light trade winds and 82°F almost year round. Cosmopolitan Honolulu features fantastic dining, world-class shopping, historic landmarks and glamorous Waikiki Beach. Larger than Hawaii’s other main islands combined, the Big Island of Hawaii is spectacularly diverse in both landscapes and activities. Pristine beaches, curious lava formations, the earth’s tallest sea mountain and the world’s most continuously active volcano all make this island a completely unique adventure. Hilo is its main port. Kauai offers a different kind of paradise – more low-key and pristine, and somehow more authentic. 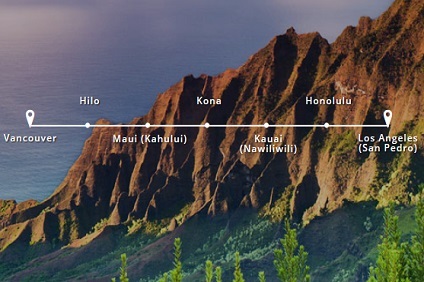 A Kauai rule states no building can exceed the height of a coconut tree, so the skyline is dominated by swaying palms, majestic mountains and almost daily rainbows. Locally based cruises are 7 nights while cruises that start on the West Coast are generally 14 to 15 nights duration. Occasionally the local cruises do longer itineraries that include Fanning Island in Kiribati. The locally based ships operate year round while cruises from the west coast tend to operate from September to April. These are often repositioning cruise pre and post the Alaska season. Lying mostly within the tropics, the weather here year round is warm (mid 80s F/32c) While generally it is not very wet the rainier period is from November to February.